Poe and Kaz do some creepy investigating on this week’s Resistance. 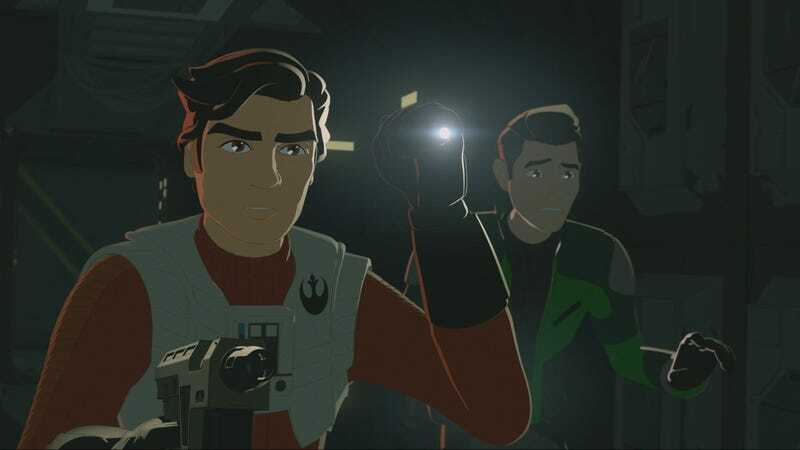 The latest episode of Star Wars Resistance, “Signal from Sector Six” may have been its most fun episode yet. It brought back Poe Dameron, had some very familiar creatures running around, and introduced an intriguing, brand new character. The main story of the episode saw Poe visiting Kaz to bring him out for some flying. Anytime we see the character, whether it’s in Resistance, the movies, or comics, it elevates everything. And he didn’t disappoint, teaching Kaz some new flying tricks, loving BB-8 like only Poe could, and more. Eventually, the flyboys get a distress call and head to an abandoned pirate ship floating near them. That’s when the episode started to feel like Ridley Scott’s Alien, with Poe and Kaz creeping around a long, deserted spacecraft as mysterious creatures dart through the darkness, eating people along the way. That ended quickly, though, when it was revealed the creatures are Kowakian monkey-lizards, a species popularized by Salacious B. Crumb, Jabba the Hutt’s droid-nibbling, laughing friend from Return of the Jedi. And these Kowakians didn’t disappoint, annoying the crap out of Poe, Kaz, and the droids to the point where actor Oscar Isaac literally says the words “I hate monkeys. I hate them so much.” A moment that will surely be memed across the internet. Then there was the hilarious revelation that, somehow, one of the Kowakians became outrageously large (basically Rathtar size) and began chasing Poe and Kaz all over. However, before they escape, they find and rescue a humanoid survivor. Poe said he had a gift for Kaz, an X-Wing, but then took it back, which was odd. That survivor is named Synara San and though she pretends to be one thing, we soon realize she’s an evil pirate who is now embedded on the Colossus thanks to Kaz. We’ll see just how that plays out soon. Overall though, simply seeing Poe Dameron on a mission—flying, shooting, spouting wisecracks—makes for good TV. Add in those monkey-lizards, some creepy visuals, and a nice mystery and you have one of the best episodes of Resistance yet.